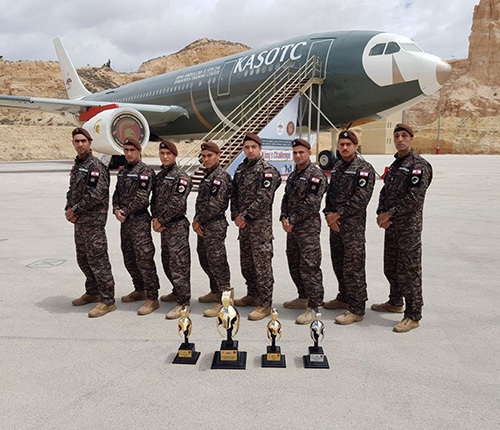 The 10th Annual Warrior Competition concluded at King Abdullah II Special Operations Training Centre (KASOTC) in Amman, capital city of Jordan on Monday 07 May 2018. The Annual Warrior Competition is a championship that is based on physical ability, teamwork, and communication. It took place from April 30 until May 7, 2018. Lebanon’s Black Panthers and Internal Security Forces (ISF) won the championship, and ranked 1st in the competition. The Panthers are one of the Special Forces of the Lebanese Army. They are the most-advanced force in Lebanon. The members’ identities are kept a secret to the local and international communities. China’s Snow Leopards Commando Unit won the runner-up and the U.S. team took the third place. China won the group champions in 2013, 2014 and 2017. The seven-day international competition attracted a total of 40 elite teams from 25 countries including: the United States of America, China, Poland, Portugal, Sweden, Austria, Czech Republic, Ukraine, India, Greece, Kosovo, Moldova, Oman, Kuwait, Qatar, Turkey, Saudi Arabia, the United Arab Emirates (UAE), Sudan, India, Brunei, Belarus, Kazakhstan, Kenya, and Jordan. The teams competed in eight challenging events covering all areas of special operations such as precision shooting, obstacle shooting, special rescue, and tactical transfer. The competition is specifically tailored to challenge and enhance the abilities of the teams competing for the title as it highlights individual skills of the team members as well as their ability to work together to plan and execute the hardest yet most realistic and challenging tasks and scenarios these units may face on duty, according to the organizer.